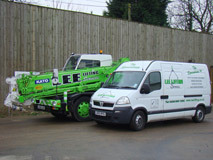 Lee Lifting Services has many years of experience in the crane industry and for a while has recognised the ever increasing need for the safe manoeuvring of equipment, plant and machinery into and around ever decreasing and awkward spaces. Our own experiences show little consideration has been given to the replacement of building services plant, installation of office equipment etc. 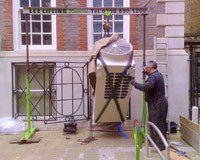 With this in mind Lee Lifting Services sought to employ staff with the necessary specialist experience and initiative to carry out your moving requirements in the safest possible way. 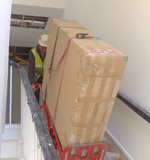 We can move heavy/awkward items up/down stairs, over floor obstructions, move items in low headroom areas, turn high items to fit under door openings. Copiers, printers, process equipment, servers, ups units, air conditioning equipment, safes. Plant rooms……..
Chiller assemblies, compressor & motor exchanges, pumps, control equipment, heat exchangers, transformers, batteries. Factory & Industrial……. Metal working machinery, wood working machinery, printing equipment, process equipment, component exchanges (motors, gearboxes) Specialist Applications……. Lee Lifting Services have specialised surveyors who can visit site to discuss your exact requirements, have the practical knowledge to identify any potential issues which hopefully can be addressed before the day of your move. 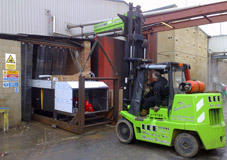 Lee Lifting Services have invested in a range of specialised equipment to enable us to arrive on site confident we will in most cases be able to carry out your requirements. 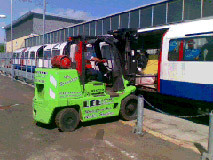 Our initial vehicle came fitted with a rear mounted 38 t/mtr crane which we found to have many advantages over a traditional front mounted unit in terms of access and usability, it enabled us to take full advantage of the reach and capacity by working over the rear of the vehicle with no increase in distance due to outriggers/load bed/cab etc. 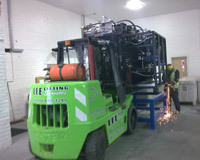 The popularity of this concept prompted us to commission a further custom built unit. Based on a new Volvo chassis we wanted to push the boundaries of what had previously been achieved with rear mounted cranes. Working in conjunction with Volvo and Transloader Services of Harpenden we achieved the first unit of its’ kind, having a 66 t/mtr crane with a reach of over 25 mtrs whilst still maintaining a load bed of some 6.5 metres. In addition we also took delivery of a low bed tri-axle plant trailer for greater payload flexibility. Equipped with over 200 items of lifting/moving tackle (slings,jacks,skates,chain tackles) we feel this should cater for most scenarios planned and otherwise.